Well-being vs. the Traditional HRA: Who Wins? A productive workforce is a profitable workforce. Whether through management initiatives, outside consulting or wellness programs, employers are increasingly invested in understanding, quantifying, and ultimately improving productivity. The multi-billion dollar wellness industry claims to be able to achieve all three objectives, through identifying and mitigating health risks that may negatively impact productivity. However, while the venerable health risk assessment (HRA) remains a staple in the majority of workplace wellness programs, new research suggests that it may not be the most effective measure to guide efforts aimed at improving productivity. Since the traditional HRA focuses almost exclusively on physical risk, many barriers to high individual performance, such as financial troubles and a disengaged work life, may be overlooked. By contrast, taking into account an individual’s well-being – which includes factors like emotional health, healthy behaviors, work environment, basic access to care, community quality and safety, and life evaluation in addition to physical health – gives a much more accurate picture of both current and future productivity levels. A new study, published in the Journal of Occupational and Environmental Medicine, verifies the distinct advantage of individual well-being measurement over an HRA in predicting changes in employee productivity over a two-year period. The study found that change in well-being was the most significant independent predictor of productivity change across three measures: self-reported job performance, self-reported on-the-job productivity loss, and employer-reported unscheduled PTO use. The well-being assessment performed four times better than the HRA in explaining variances in job performance and nearly three times better for presenteeism. Even after removing the physical health aspects (physical health and healthy behavior domains) of the well-being score – aspects on which HRAs typically focus – well-being maintained its advantage over the HRA, confirming the importance of non-physical factors to workplace productivity. With the amount of money spent on workplace wellness continuing to rise, investing in the correct tool to identify the factors that most affect productivity change over time can maximize not only your employee performance and well-being, but your bottom line. Over the 5-year period of the study, healthcare costs decreased 21.5% as well-being improved 13.5%. Perhaps spurred by a desire to avoid the looming 40 percent excise tax on so-called “Cadillac health plans” that’s set to come into effect in 2018, more employers are offering or considering offering consumer-driven health plans (CDHP)—also known as high deductible health plans. According to 2014 research by Aon Hewitt, 60 percent of organizations currently offer a CDHP to their employees—a 4 percent increase from the previous year. Maybe even more telling of this industry-wide shift to CDHPs is that 42 percent of employers are considering offering one as its sole benefit option within the next three to five years, entirely phasing out alternate options such as preferred provider organizations (PPO). Both employers and employees are unsure about the potential pitfalls of the higher employee cost-share that is the hallmark of a CDHP—which may include employees feeling less engaged at work, being more apt to leave for other organizations where their cost-share would be lower, and delaying or avoiding necessary healthcare such as office visits, testing or medication. A new study authored by the Healthways Center for Health Research, which was published last month in the Journal of Occupational and Environmental Medicine, provides a case study in which an employer was able to sidestep these negative consequences and actually experience significant positive outcomes, even when executing an organization-wide transition to a CDHP. The study, “The Value of a Well-Being Improvement Strategy: Longitudinal Success across Subjective and Objective Measures Observed in a Firm Adopting a Consumer-Driven Health Plan” makes a significant scientific contribution, as it’s one of the first longitudinal studies of the effect of a well-being improvement strategy on outcomes over an extended period of time—five years, in this case. The linchpin of the employer’s strategy was twofold: 1) implement a robust well-being improvement program and 2) support the program by creating and sustaining a pervasive culture of well-being throughout the organization. The employer’s program included such rich offerings as company-sanctioned fitness activities, weight loss and tobacco cessation programs, online well-being improvement plans and resources, free membership at a national network of gyms, and health coaching. All of these offerings were underscored by a visible and purposeful organizational culture of well-being. This new study shows that a comprehensive, multi-year well-being improvement program can reduce healthcare costs and create a workforce that is healthier, has higher well-being, and is more productive. It also builds on earlier Healthways research that demonstrated the important role culture plays in supporting the success of a well-being improvement program. Employers interested in better understanding how to create a roadmap for creating a strong culture of well-being (similar to the employer studied in this paper) will want to see our infographic, “Creating a Culture of Well-being: Five Steps to an Action Plan.” In it, we’ve collected five top characteristics of organizations that have achieved a culture of well-being. We’ve also identified key questions your planning team should ask to help benchmark your organization’s current position and help create a roadmap to your ultimate goal. This article originally appeared in the Gallup Business Journal and is reposted with the permission of Gallup. Two major factors influence employee performance, Gallup has found: engagement and well-being. Gallup measures engagement for employees through the Q12 survey, which consists of 12 actionable items with proven links to performance outcomes. And with Healthways, we measure well-being through five elements that are crucial to a life well-lived. Now, many organizations measure and evaluate their employees' engagement, while others focus on improving their workers' well-being. But what happens when companies try to improve both? Does strong well-being take a highly engaged workforce and make it even better? And how can each one be applied to enhance the other? Based on employees' responses to the Q12 items, Gallup groups workers into one of three categories: engaged, not engaged or actively disengaged. Just 32% of U.S. workers are engaged in their jobs, setting them apart from other workers in terms of their attendance, performance, service quality, safety and likelihood to stay with their current company, among other factors. 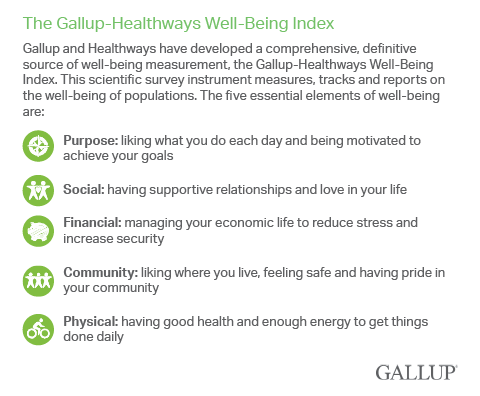 Similarly, Gallup and Healthways have developed a comprehensive, research-based definition of well-being that encompasses five interrelated and essential elements: purpose, social, financial, community and physical. Together, these elements provide key insights into individuals' sense of purpose, social relationships, financial security, relationship to their community and physical health. In the U.S., 28% of adults aged 18 and older are not thriving in any element, while just 19% are thriving in at least four of the five. For every two U.S. adults who are exhibiting high levels of well-being across most or all elements, there are three who have significant room for improvement across them all. The question researchers have explored is: How do employees who are engaged and who exhibit high well-being in at least four of the five elements fare compared with engaged workers who have high well-being in only three or fewer elements? Does adding high well-being to high engagement have a beneficial effect on key outcomes? Strongly encourage participation in well-being activities when setting job expectations. Let employees choose the well-being activities that are best suited to them based on their individual well-being goals. This approach simultaneously promotes clarity about an employee's role and a culture of well-being, and it does both while honoring each employee's unique talents and interests. Recognize employees for their well-being achievements. Recognition reinforces what is valued within an organizational culture. One reason recognition is such a strong driver of employee engagement is that if employees feel they will be recognized for doing great work, they will be highly motivated to do so. The same principle applies to enhancing well-being. Increase recognition to increase effort -- and improve well-being and engagement at the same time. Explicitly link each well-being activity to at least one of the five elements. The five elements of well-being add depth and dimension to "feeling cared about," a key component of engagement. The five elements can help managers more clearly individualize activities to each employee's situation through discussion and by creating a more focused set of goals. Leaders and managers should communicate that the five elements are important organizational values and show how each well-being program links to one or more of the elements. Communication that emphasizes that leadership cares about employees' -- and their families' -- well-being can go a long way in encouraging employee engagement and employee participation in well-being programs. Solicit employee ideas and incorporate them into workplace well-being initiatives. "Opinions count" is a central component of an engaging workplace. Asking employees to contribute well-being ideas is a great way to galvanize them and make them feel they are a part of the well-being movement. Employees also will have excellent feedback about which well-being programs are working and which aren't -- and how they can be revised or new programs added. Include well-being goal-setting and milestones in work review and progress meetings. Research has shown that engaged employees are much more comfortable than other employees in discussing their well-being goals with their manager. But the five well-being elements can be incorporated into progress-review conversations in ways that encourage employees to pursue their well-being goals and that can deepen the manager-employee relationship. One way to start this conversation is for a manager to ask, "Is there an aspect of your well-being that I can support?" Ultimately, organizations can benefit substantially by adding well-being to their engagement programs. By ignoring well-being, or by focusing on physical wellness programs alone, employers miss important opportunities to improve employee performance. Results are based on a Gallup Panel Web study completed by 24,230 national adults, aged 18 and older, conducted Oct. 8-Nov. 13, 2014, and a Gallup Panel Web study completed by 24,658 national adults, aged 18 and older, conducted Dec. 2, 2014-Jan. 14, 2015. A subsample of 9,689 working adults, obtained after matching the above two surveys, was used for this analysis. The Gallup Panel is a probability-based longitudinal panel of U.S. adults who are selected using random-digit-dial (RDD) phone interviews that cover landline and cellphones. Address-based sampling methods are also used to recruit panel members. The Gallup Panel is not an opt-in panel, and members are not given incentives for participating. The sample for this study was weighted to be demographically representative of the U.S. adult population using 2014 Current Population Survey figures. For results based on this sample, one can say that the maximum margin of sampling error is ±2 percentage points at the 95% confidence level. Margins of error are higher for subsamples. In addition to sampling error, question wording and practical difficulties in conducting surveys can introduce error and bias into the findings of public opinion polls.